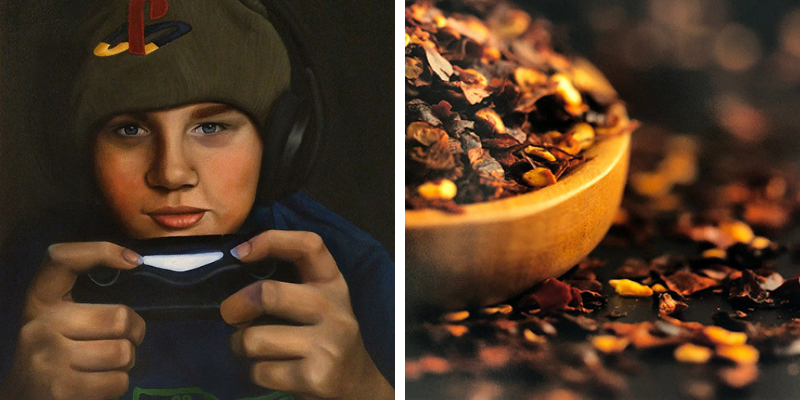 Alison Miller watched her son navigating PlayStation, the inspiration for her award-winning painting. Alison Miller's oil on canvas "Player One Ready! ", left, and Melinda Watson's photograph "Red Pepper Flakes"
The Painting II assignment called for staging and photographing a person interacting with an object and applying it to a canvas. Tidewater Community College student Alison Miller knew she wanted a creation that combined the mysterious with the unique. She considered replicating her son, Kaine, playing his viola, but it didn’t translate well into a painting. On a whim, she told him to grab his PlayStation, her inspiration for Player One, Ready!, winner of the Visual Arts Center Purchase Award. Miller’s painting was one of several recognized at the 49th Annual Student Art & Design Exhibition at the VAC. “When the judge described my painting during the ceremony, she commented on the details and the emotion that I hoped was captured, giving me a boost in my confidence toward my work,” said the Navy wife, who will graduate in May with associate degrees in Studio Arts and Pre-Art Therapy.